New payment models, such as pay-for-performance and hospital value-based purchasing programs, are the new reality in healthcare. These programs use financial incentives and penalties to encourage hospitals and other healthcare providers to implement strategies to achieve optimal patient outcomes and/or reduce the cost of care. Value-Based Purchasing: Driving Down Infection Rates to Improve Patient Safety will help you understand what value-based-purchasing (VBP) drivers can be impacted by surveillance to help make the case for a surveilllance solution to the C-suite. 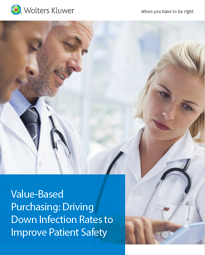 This guide will also communicate the value of robust infection prevention and antimicrobial stewardship programs and understand the value-based purchasing metrics on which they have an impact.